Duo Hydrochoeri hydrochaeres, singuli maximorum Rodentium exstantium, quae ponderis usque ad 91 kg possunt; spectaculum "Zona Brazil" in Vivario Bristolensi, Bristolii Angliae. 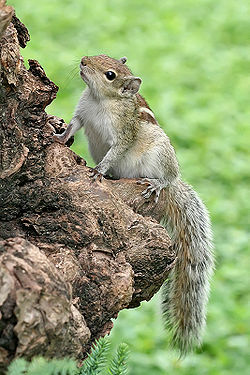 Tamias striatus cibum in buccis fert. Rodentia sunt ordo mammalium quorum proprietas principalis est in maxillis superioribus et inferioribus duo incisores continenter crescentes, quibus breviores faciendum est rodendo. Inter genera bene nota sunt Castor, Cricetus, Laonastes, Mus, Rattus, Sciurus. Quadraginta centesimae specierum mammalium sunt Rodentia, quae in numeris amplissimis trans omnes continentes endemicae sunt, Antarctica et interiore Groenlandiae parte exceptis. Inter eorum numerum sunt mures, ratti, sciuridae, hystricomorpha, castores, Caviae porcelli, et cricetinae. Rodentibus sunt acuti incisores, quibus ea lignum adrodunt, victum refringunt, praedatores mordunt. Plurima seminibus vel plantis vescuntur, sed nonnullis sunt alimenta varioria. Nonnullae species sunt pestes quae semina ab hominibus coacervata comedunt morbosque communicant. Numeris specierum—quamquam non numeris organismorum vel biomassae—Rodentia sunt maximus mammalium ordo. Sunt circa 2277 species Rodentium (Wilson et Reeder 2005), plus quam 40 centesimae specierum mammalium. Prospere procedunt probabiliter ob eorum magnitudinem parvam, breve feturae tempus, et facultas rodendi et multorum ciborum edendorum (Lambert 2000). Inveniuntur Rodentia numeris amplissimis in omnibus continentibus praeter Antarcticam, in plurimis insulis, et in omnibus habitationibus praeter oceanos. Eorum est solus ordo animalium placentalium non volantium et non marinorum, et solus ordo praeter Chiroptera et Pinnipedia qui Australiam sine introductione humana attigit. Omnibus Rodentibus sunt dentes rodendo apti; ergo eorum nomen scientificum. Omnibus Rodentibus est unum incisorum superiorum par et unum incisorum inferiorum par, ante spatium (diastema) situm, tum unum vel plurium molares vel praemolares. Hi incisores continenter crescunt ac rodendo conteruntur. Superficies anteriores lateralesque enamelo teguntur, sed superficies posterior est dentinum expositum. Incisores rodentes inter se frendunt, mollius dentinum conterentes et marginem enameli acutam sicut lamina scalpri efficientes. Hoc exemplar acuendi est efficacissimum et una ex causis prosperitatis Rodentium. Rodentia dentibus caninis carent, et diastema inter incisores et praemolares habent. Ea dentibus utuntur ad lignum adrodendum, cutem fructuum seminumque refringendum, et praedatores mordendos. Paene omnia Rodentia plantis vescuntur, praecipue seminibus, sed pauca, sicut Onychomys leucogaster, insecta, et pauca, sicut castores, pisces comedunt. Nonnullae Sciuridae Cardinalidas, Cyanocittas cristatas, et alias aves passeriformes comedunt. Multa Rodentia sunt parva: Mus minutoides quidem maturus solum 6 cm longus et 7 g ponderis potest, et Salpingotulus michaelis dimensiones fere similes habet; sed Hydrochoerus hydrochaeris plerumque usque ad 65 kg ponderis est, quamquam singulus 91 kg ponderis esse observatus est, et maximum Rodens notum, Josephoartigasia monesi, animal exstinctum, traditur ponderis fuisse circa 1000 kg, et fortasse usque ad 1534 kg aut etiam 2586 kg. Rodentium ordinis divisiones sunt subordines, infraordines, superfamiliae, familiae. ↑ 1.0 1.1 "rodent - Encyclopedia.com"
↑ B. G. Meerburg, G. R. Singleton, et H. Leirs (2009). "The Year of the Rat ends: time to fight hunger!". Pest-Management Science 65 (4): 351–2 . ↑ Phil Myers (2000), "Rodentia," in Animal Diversity Web (University of Michigan Museum of Zoology). ↑ Pearsall, J., ed. (2002). The Concise Oxford English Dictionary, ed. 10a, retractata. Oxfoniae: Oxford University Press. p. 1,239. ISBN 0-19-860572-2 . ↑ J. L. Hurst (1999), "Introduction to rodents," in The UFAW Handbook on the Care and Management of Laboratory Animals, vol. 1, Terrestrial Vertebrates, ed. 7a, ed. T. Poole (Oxoniae: Blackwell Publishing), pp. 262–273. ↑ P. Myers (2000), Rodentia (Animal Diversity Web). ↑ Millien, Virginie (05 2008). 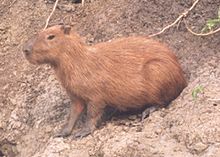 "The largest among the smallest: the body mass of the giant rodent Josephoartigasia monesi". Proceedings of the Royal Society B 275 (1646): 1953–1955 . ↑ Rinderknecht, Andrés; Blanco, R. Ernesto (01 2008). "The largest fossil rodent" (pdf). Proceedings of the Royal Society B 275 (1637): 923–928 . Adkins, R. M., E. L. Gelke, D. Rowest, et R. L. Honeycutt. 2001. Molecular phylogeny and divergence time estimates for major rodent groups: Evidence from multiple genes, Molecular Biology and Evolution 18(5): 777–791. PMID 11319262. Carleton, M. D., et G. G. Musser. 2005. "Order Rodentia," pp. 745–752 in Mammal Species of the World: A Taxonomic and Geographic Reference. Baltimorae: Johns Hopkins University Press. Lambert David, et Diagram Group. 1985. The Field Guide to Prehistoric Life. Novi Eboraci: Facts on File Publications. ISBN 0-8160-1125-7. Leung, L. K. P., Peter G. Cox, Gary C. Jahn, et Robert Nugent. 2002. Evaluating rodent management with Cambodian rice farmers, Cambodian Journal of Agriculture 5: 21–26. McKenna, Malcolm C., et Susan K. Bell. 1997. Classification of Mammals Above the Species Level. Novi Eboraci: Columbia University Press. ISBN 0-231-11013-8. Nowak, R. M. 1999. Walker's Mammals of the World, vol. 2. Londinii: Johns Hopkins University Press. Steppan, S. J., R. A. Adkins, et J. Anderson. 2004. Phylogeny and divergence date estimates of rapid radiations in muroid rodents based on multiple nuclear genes, Systematic Biology 53(4): 533–553. DOI 10.1080/10635150490468701. PMID 15371245. Wilson, D. E., et D. M. Reeder, eds. 2005. Mammal Species of the World: A Taxonomic and Geographic Reference. Baltimorae: Johns Hopkins University Press.